marcus evans news | Ipswich Town Football Club is the Number One Venue! 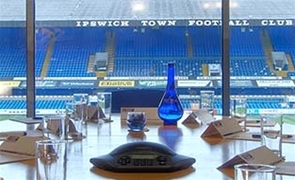 Did you know that Ipswich Town Football Club is a unique venue, with excellent facilities and an award winning hospitality and catering team? The venue also provides an inspirational backdrop for any meeting or occasion. Breakfast Meetings / Afternoon Tea / Private Dining / Business Lunches Meetings / School Proms / Formal Dinners / Evening Receptions / Networking Events / Exhibitions / Product Launches / Weddings / Funeral & Wakes / Receptions / Fashion Shows / Plus much more. If you prefer a lively atmosphere during your pre-match meal; the Sir Bobby Robson Suite is for you. The Hall of Fame Restaurant is an exclusive match day experience with an ambiance paying tribute to legends; the ex-players of the Ipswich Town Hall of Fame. Perfect for those who want a high quality seat in an ideal viewing area at the centre of the Cobbold Stand with the option to purchase food from the Far Post Bar or the Sir Alf Ramsey Suite or to book into the Hall of Fame Restaurant for a pre-match meal. We offer an extensive range of rooms and Suites for all types of meetings, seminars, training events, interviews, working lunches, plus exhibitions, product launches, ceremonies - the list is endless. These packages have been established by matching your anticipated attending numbers to the most suitably sized suite in which to accommodate your event. Unlike the delegate package, these are priced by package rather than per delegate. Dinner Packages have been thoughtfully constructed in response to the huge demand we have witnessed for packages of this kind, inclusive of VAT, these are easy to work with and great for budgeting! You can also follow us on Twitter or Like us on Facebook!